On Monday, our group split up into two teams. 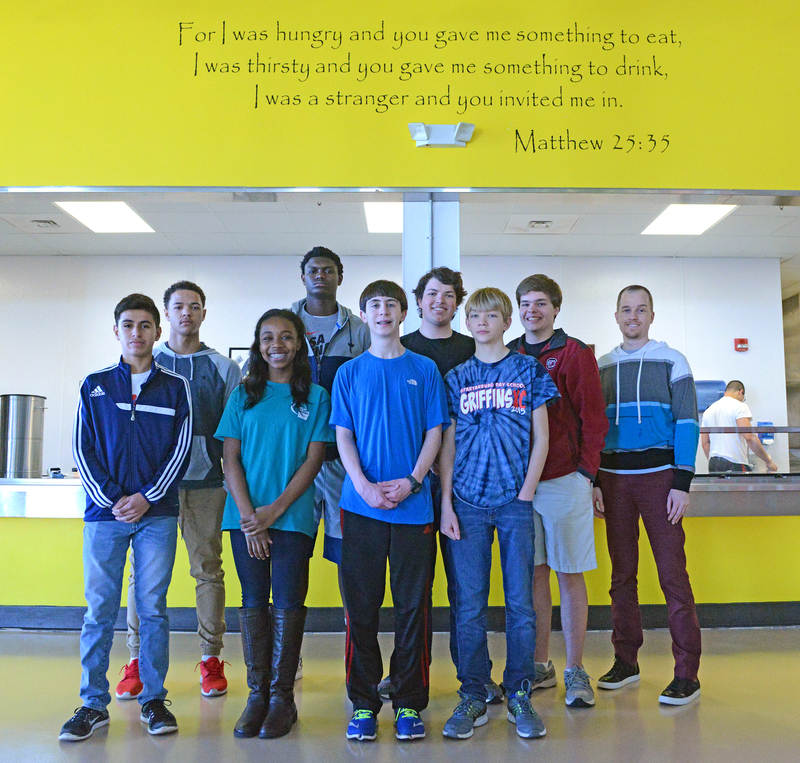 One team went to Total Ministries and the other group went to Spartanburg Soup Kitchen. Total Ministries provides those in need with economic support and essential supplies such as food. We spent our time there sorting and weighing food and then putting that food on the shelf. We really enjoyed seeing how such a small, non-profit organization kept itself operating so it could help others. At the soup kitchen, we managed the big supply of canned foods in the back and then served food to the visitors. We were amazed by how many people count on the soup kitchen for their daily needs. One of the groups doing community service, pictured here at Total Ministries. After eating lunch in the area, we all headed down to the Seneca, SC, to spend the rest of our week. On Tuesday, the whole group went into Seneca to Golden Corner Food Pantry. This pantry provides food for all of Oconee county to those who cannot afford food. During our stay, we filled and organized meat bags while the girls helped fill and organize dry foods and vegetables. I really liked doing this because I was impacting many families with every bag of food I made. On Wednesday, the whole group went to the fire station in Seneca. The fire station serves the community in a variety of ways. The put out fires, but also provide safety inspections for example. At the fire station, Melodie share with us all the ways the station serves the community. Afterwards, she took us on a tour. Then she had a game for us that helped us learn how to roll and unroll a fire hose and then to shoot it. I liked learning about the life of a firefighter and their value because I didn’t know much at first. The second group of students, this time at the soup kitchen. On Thursday, we went to Lake Keowee Senior Home and Helping Hands Children Shelter. The nursing home serves older people who can’t manage on their own. The children’s shelter takes care of kids who need to be taken care of because of the bad situations they were in. We played games and hung out with the seniors at the home. At the children’s home, we learned about how they serve the country and then got to spend time playing with the kids outside on the playground. I liked making everyone happy and putting smiles on their faces.